Everyone pile into the covered wagon, we’re headed down the Oregon Trail. Our friend at Vin Bin recommended this Willamette Valley Pinot Noir the other day at a tasting. We were looking for a softer red to drink with more mild dishes like chicken and fish and ended up in Oregon. Apart from the screw top, I have an irrational hatred for screw tops, it was a decent wine for $15. We enjoyed it with baked chicken breast and green beans. MobyGrape: 75. This wine had an overwhelming smell and taste of grapefruit. Definitely worked better with food, where it tasted more like wine instead of someone accidentally spilling grapefruit juice into some wine and claiming it’s a wine cooler. I’m taking some heat from the Colonel for not commenting about the other attributes of the wine. PS it was red and wet. colonelgrape: 78. I thought it was a fairly average pinot noir. It had a translucent bright red color, you could see through the glass easily. It was an acidic wine but I didn’t get the same grapefruit taste Moby did….more strawberries and bright fruit. Hardly any tannins and not very dry, this was the perfect style red to have with a light meal. Considering it was only $15 it’s hard not to be pleased however I think at the $30 price point this region could produce some seriously delicious pinot noir. 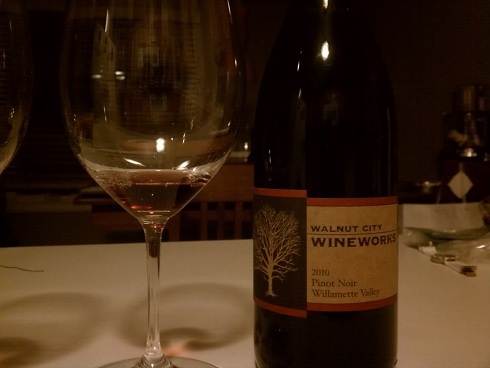 This entry was posted in Oregon, Pinot Noir, United States on December 9, 2012 by colonelgrape.